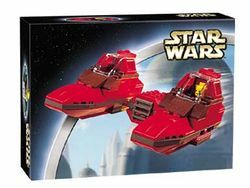 Twin-Pod Cloud Car is a Star Wars Classic set released in 2002. The set includes Lobot and a Cloud City Twin-Pod Cloud Car. Most of the pieces are red. The base colour of the set is red, like it was in the movie. The two pods are connected by a beam with an engine that has a grey grill on the front. The pods have red sloping bricks on the top and the bottom with a grey one between them. Behind the vent is the engine. Above that is maroon bricks with a glass. Cloud cars were used for security patrols of Cloud City. This is a two seat version with seating for a co-pilot along with Lobot. In the movie they have guns. Although this set had seating for two Minifigures, it only came with one. The set comes with Lobot even though he was not seen in a Twin-Pod Cloud Car in the film The Empire Strikes Back. This is a description taken from LEGO.com. Please do not modify it. Soar through the clouds in the Twin-Pod Cloud Car! You're ready to travel to Cloud City on Bespin in the Twin-Pod Cloud Car! The cyborg Lobot is your guide to this strange, beautiful world. Facts about "7119 Twin-Pod Cloud Car"
ShopDescription Soar through the clouds in the Twin-Pod Cloud Car! This page was last edited on 9 January 2016, at 20:27.